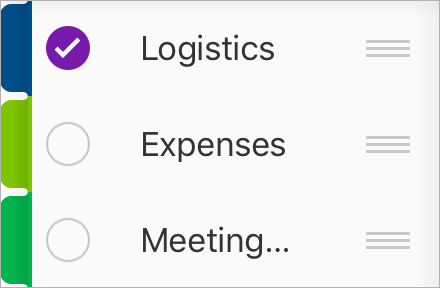 In OneNote, sections and pages are listed in the order they were created. If you want to arrange your notebook differently, it's easy to move or copy notes to other sections, or even move entire sections to other notebooks. Tap Edit and select the section that you want to move or copy. 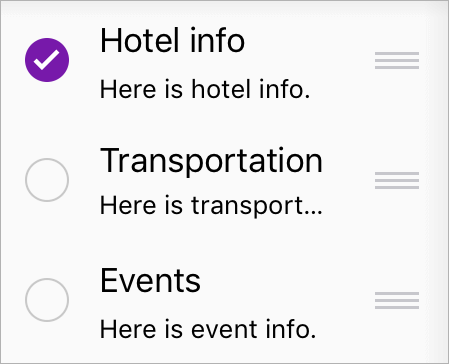 Tap the Move icon at the bottom of the list, and then select the notebook in which you'd like to move or copy your section. Tap Edit and select the page that you want to move or copy. Tap the Move icon at the bottom of the list, and then select Move or Copy. Select the section in which you'd like to move or copy your page. Tip: If you just want to rearrange the order of pages within a section, tap Edit and select the page you want to move. Then tap the handle and drag the page up or down the page list. It works the same way if you want to rearrange sections within a notebook.